Eric Dickerson is a legend in all respects, a Hall of Famer and one of the best running backs to ever play the game. He also used to play for the Rams. And like most Rams fans, he's convinced that the Patriots cheated during their last Super Bowl matchup against the Rams. 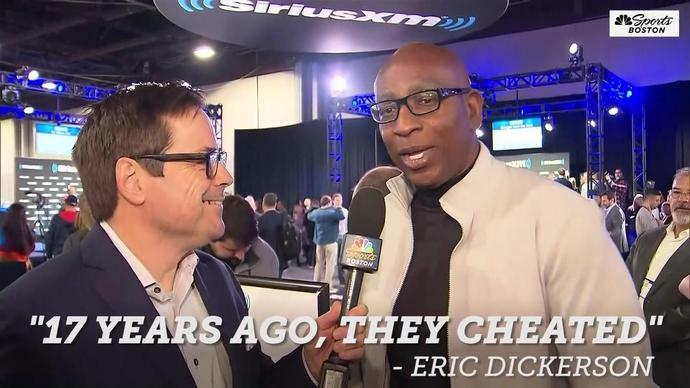 In an interview with NBC Sports Boston's Gary Tanguay, Dickerson said that the Patriots were guilty of underhanded tactics all those years ago. "Look, the Patriots are a great football team, but yeah, they cheated. 17 years ago, they cheated. Hey, all teams cheat. 'If you ain't cheatin', you ain't tryin,' that's the NFL motto." Despite his assertion that all teams cheat, Dickerson doubled down when asked if the Patriots would have won had they not cheated. "Against the Rams? No. Absolutely not." Dickerson acknowledged the dominance of the Patriots, but wouldn't back down from his overall claim, bringing up the infamous Tuck Rule game and how the Super Bowl matchup that year should've been the Raiders and the Rams. Dickerson did admit that his personal feelings about the outcome of the game have lingered. "I am bitter!... After we win, I'll let it go," said Dickerson, announcing his pick for the Super Bowl in the process. Dickerson is doing his due diligence as a franchise legend defending his old team. Sunday will show if the Patriots will prevail yet again over the Rams.